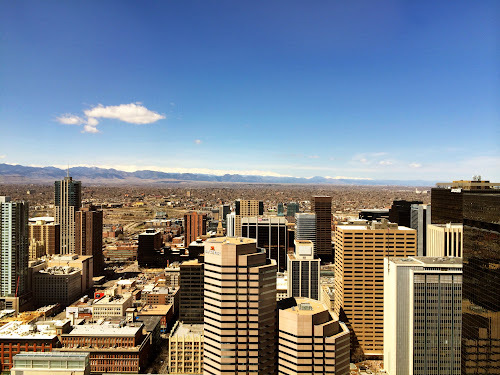 This afternoon, Dom invited me up to the 40th floor to check out the view and maybe to demonstrate that you really could see the Rockies if you had the right viewpoint. And the view was spectacular. We walked all the way around looking at the views from each side of the building. It turned out that Dom's building was right across the street from the conference hotel. 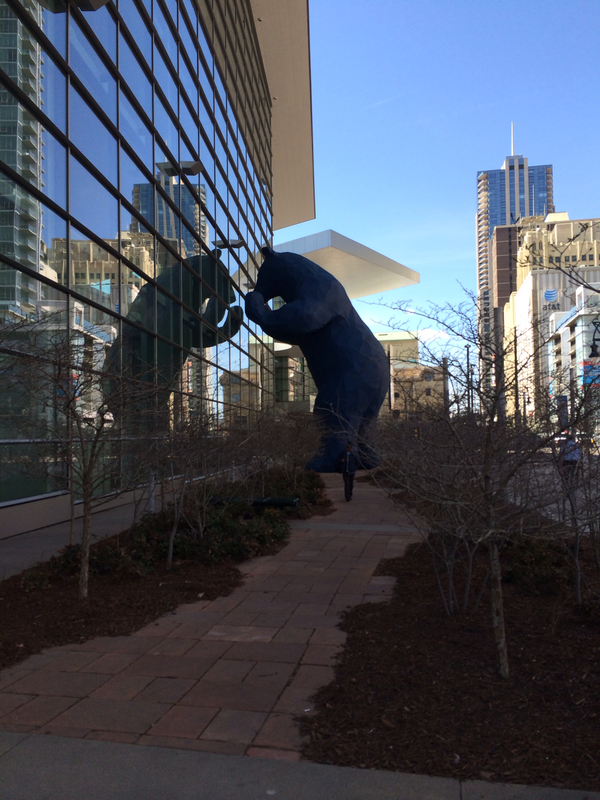 Later in the afternoon after the afternoon sessions, I headed away from the hotel and the first stop was the Blue Bear at the Denver Convention Center. I had seen models of this at the Denver Art Museum last night but at that time, didn't even have any idea where the convention center was. As you may have figured, it wasn't that far from the conference hotel. After passing under the convention center along the walkway, I worked my way away from the downtown area to a more industrialized area. Since the blog is mostly about moto-topics, here is why I went for a walk. 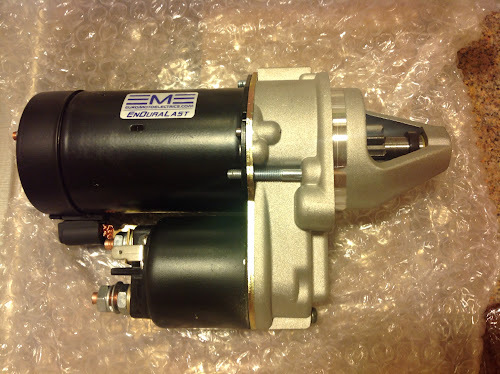 Euro Motelectrics (EME), the same company that made my new higher output alternator, also makes a starter. This is a modified Japanese starter that has a planetary gearset between the motor and the gear. I think that it is made by Nippon Denso. It draws less current than the stock Bosch starter and spins the engine faster. Kind of a win-win in my book and something that I could use especially in the winter. I was reluctant to order it this earlier due to the shipping cost. After all, starters aren't that light and now I could bring it back inside of my checked luggage. 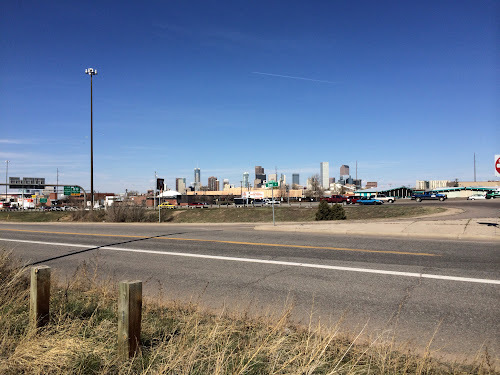 I discovered that EME was not that far from downtown Denver and after a few email exchanges, picking it up at their storefront was an option. And it seemed like a great reason for a walk. It turned out to be a little bit further than I had thought due to some construction detours but it was a beautiful day to be outside. Several temperature signs that I passed claimed that it was 75°F in the late afternoon/early evening. I made it back in time to make dinner with a good friend from Columbia University and a group interested in two-factor authentication. Dinner was at a wonderful Italian restaurant. You are certainly having a good time! And having some fabulous clear weather. No smoggy air! Thanks for going to Denver for me! It is nice here in Denver and I always enjoy the Internet2 meetings. I was concerned for a while when they removed the technical tracks but they have been restored. At least there is no smog at this time of year. I don't know it it's always like this. I needed the exercise and it was a beautiful day for a walk. Saw parts of Denver that are off the beaten path. Stunning view from Dom's building. A great chance for a walk in the sunshine too. A big difference in temperature. I bet it doesn't feel cool anymore. No, it didn't feel cool at all though it is still cool in the mornings. After the sun sets, the breeze through these canyons they call streets can be pretty chilling. Dom beat me to it. I presume only 5 miles back to the hotel but carrying a 20 lb starter. I knew that white building in your 3rd photo was farther than I could walk. 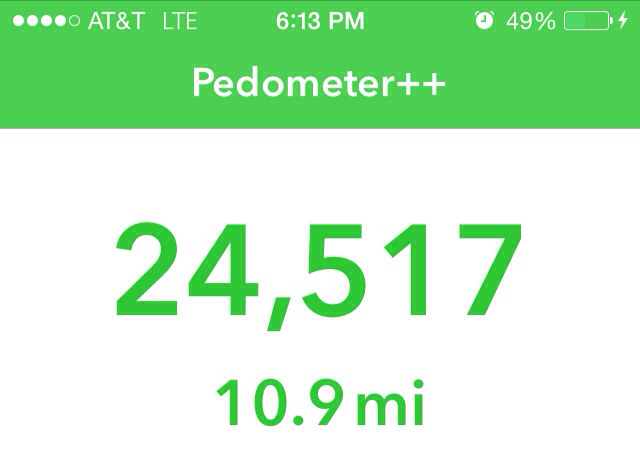 I brought a daypack so I really didn't notice the weight of the starter on the walk back. And before I knew it, I was back in the downtown area. The negative was that it was during "rush hour" so there was a lot of traffic, even on the side streets in the commercial/industrial areas. It was really nice to get out and about after sitting most of the day listening to presentations or in meetings. There is supposed to be some moisture coming into town this weekend. A meteorologist from NOAA was here this morning doing weather briefings by request for those traveling back home. And it gave him an opportunity to show off their new software. The other problem around here is that there doesn't seem to be as much air.